Surgeon - Convenience Trap. Vinyl 12. Bleep. Surgeon's latest transmission continues his newly found fetish for improvised techno produced on hardware machines. 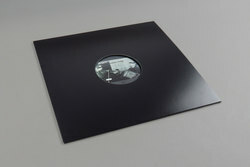 Convenience Trap welds together the traditional dynamic tension industrial sound with a feedback engrossed fierce analogue edge that hangs together to produce some of the best work from Surgeon for some time. Opening with the standard chug of Convenience Trap, Pt. 1 it's not until we hit round Pt. 2 that things really kick into gear. Convenience Trap, Pt. 2 is the sort of techno record Der Zyklus would have made during the Biometry era if they had spent the studio downtime jamming to cassettes of Steve Bicknell sets. Convenience Trap, Pt. 3 drifts back into the realm of straight up 4x4 techno, it's siren synth ringing out like a form of proto-tinnitus that's gonna haunt you later when you are laying in bed post-club having heard this banger being belted out. Convenience Trap, Pt. 4 ends things on a rather experimental note, even by Surgeon's standards. The drums thwack out with a breakbeat styling that calls to mind Oris Jay's early grime classic Nocturnal, yet the melodies shuffle along to sort of slow things down while at the same time slicing them up.